Modernizing application infrastructure while maintaining control and security is a challenge for many enterprises. Successfully leveraging public, private, and hybrid cloud infrastructure while gaining agility with microservices-based applications requires a dynamic new technology stack. IBM and NGINX are working together to provide the platforms and tools to accelerate enterprise-wide digital transformation and make today’s technology more efficient, responsive, and secure. NGINX provides a full complement of capabilities for IBM’s technologies for delivering modern applications, both in the cloud and on-premises. NGINX Plus provides caching, advanced load balancing, rich Layer 7 routing, request limiting, rate limiting, authentication and access control, real-time application delivery metrics, and other features. NGINX Plus supports servers based on IBM’s POWER microprocessor architecture to increase the scalability and performance of web serving and load balancing in the IBM Turbo LAMP software ecosystem, as well as front‑ending Java and Node.js applications for WebSphere Liberty application servers and IBM API Connect (StrongLoop) servers. 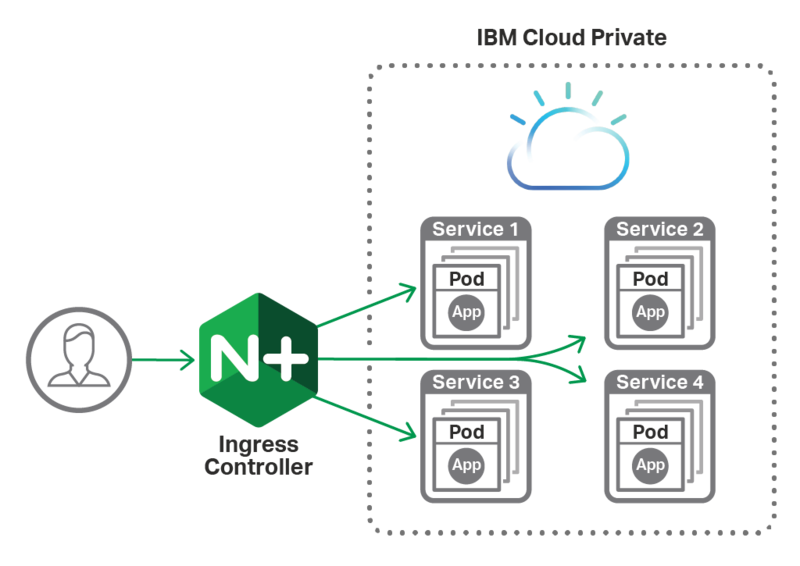 The NGINX Kubernetes Ingress Controller is available as a premium upgrade to the community Ingress controller solution included with IBM Cloud Private deployments. It provides an enterprise-class solution for securing and scaling a production Kubernetes cluster, enabling applications to be deployed with greater performance, reliability, and security. NGINX Plus delivers high performance load balancing functionality for IBM Cloud Object Storage. The advanced load balancing features of NGINX Plus make it an ideal fit for load balancing in IBM Cloud Object Storage, allowing applications to scale nearly linearly. Learn how to deploy the NGINX Kubernetes Ingress Controller in place of the default Ingress controller in an IBM Cloud Private (ICP) environment, utilizing a Vagrant-based deployment of ICP.